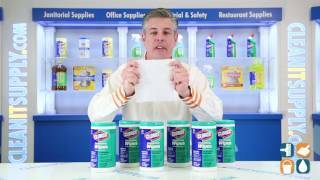 Clorox Disinfecting Wipes are the easiest solution to disinfect and clean a variety of commercial, industrial and household surfaces. 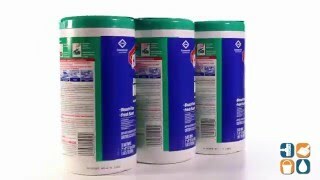 These wipes are the ideal cleaning choice for almost any environment. With Clorox Disinfecting Wipes, you never again have to buy multiple products to clean and disinfect. Clorox wipes conveniently clean and disinfect in one step and are guaranteed to eliminate 99.9% of germs, including staph, salmonella, and the viruses that cause colds and flu. Pre-moistened and bleach-free, these wipes are specially formulated to be safe for use on common wood surfaces like tables, cabinets and floors. Clorox Disinfecting Wipes provide a clear-drying formula that cleans and disinfects on almost any shiny surface. Ideal for daycare centers, offices, schools and restaurants. 75 wipes per canister, packed 6 canisters per Carton.